The motto of Thomas Reddall High School is Focusing on our future. For two days this week, that’s exactly what the school’s hospitality students did. First they heard some inspiring stories from three local chefs who’ve been there and done that – and some hard truths as well. 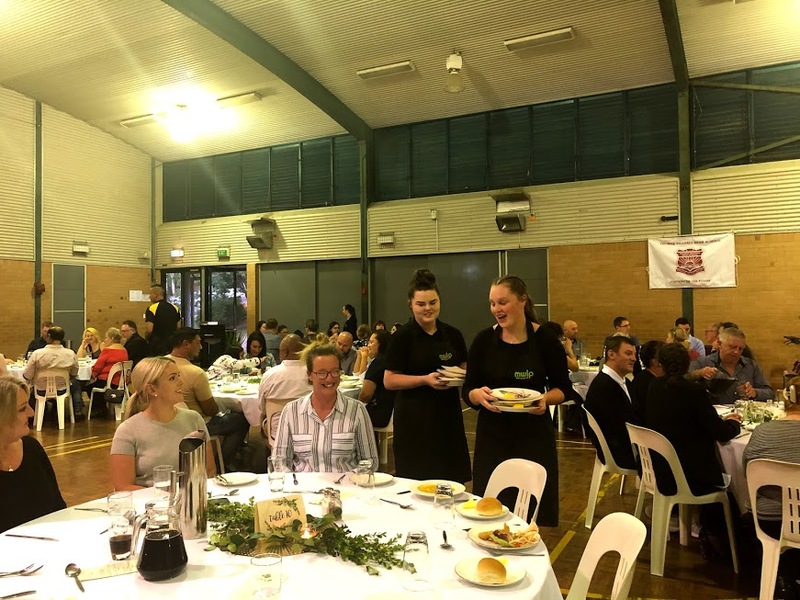 Then the students donned their aprons, cooked up a three course meal and served it to 100 people in the school auditorium. The initiative was organised by the school along with work placement organisation mwlp, which links young people to the workforce. It all started on Tuesday morning when the students listened as Graham Krueger, the executive chef of Wests Group Macarthur, Peter Shepherd, the director of culinary development at Campbelltown Catholic Club, and Darren Wills, of Hospitality Training Network who is now a mentor of apprentices, told their stories of how they ended up as chefs. And while their journeys were different, all three ended up in a place they loved: the kitchen. Indeed all three had the same message for the Year 10, 11 and 12 Thomas Reddall hospitality students: if you turn up on time every day and work hard, “the world is your oyster’’, as Darren Wills said. 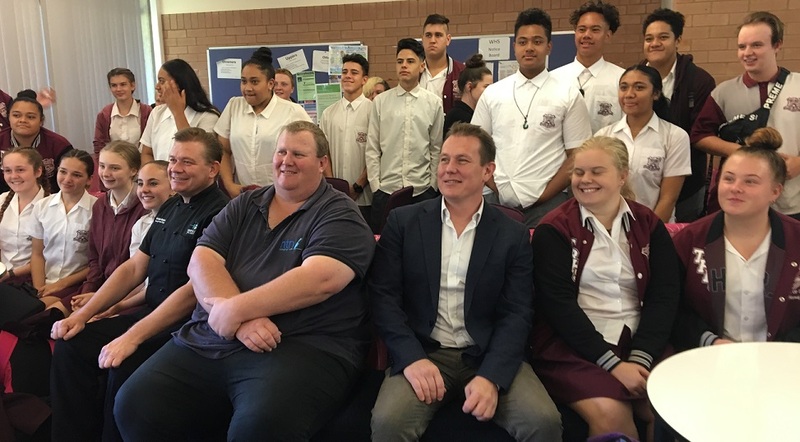 Hospitality future: Graham Krueger, Darren Wills and Peter Shepherd, (front, centre) with Thomas Reddall High Hospitality students and staff on Tuesday. Graham Krueger, who spoke first, said he had a love of cooking from a young age. “I used to work at my grandmother’s chicken shop on a Sunday, and she paid me $10 for 11 hours work. “Which was good, because I just loved cooking and making people happy,’’ Mr Krueger said. He took up an apprenticeship with Qantas, where he learned a lot because the airline’s catering was providing food for 27 other airlines. He won apprentice of the year, went on to run three of his own restaurants and over the years worked with some famous chefs, including swear bear Gordon Ramsay. “The hospitality industry is rewarding, it’s fun, it’s an interesting job,’’ Mr Grueger said. Mr Shepherd’s path to the kitchen was a little different: “I did work experience when I was 12 or 13, in a restaurant in the UK, and then we migrated to Australia,’’ he told students. “I went to school, then enrolled for a mechanical engineering degree at university, and hated it with a passion,’’ Mr Shepherd said. Looking for another option, he called the restaurant in the UK where he had done work experience to ask if they would have him back and they said yes, so he got on a plane and headed to London. When he returned to Sydney he had made up his mind hospitality was the career for him. Like Mr Krueger, he also opened his own restaurants and was doing some consulting work with the Catholic Club when they asked him if he would be interested in a fulltime job with them. 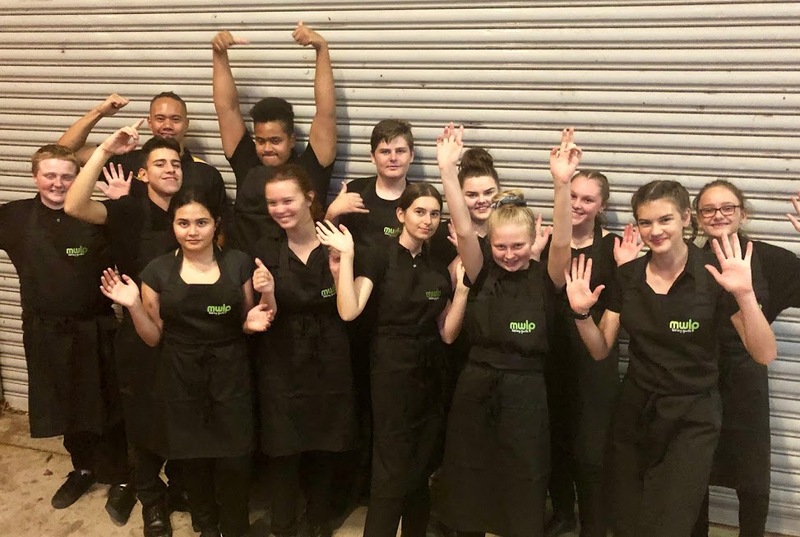 Darren Wills, who has spent 25 years in hospitality in one capacity or another, told students that at first he had “no passion, no desire’’ to be in the industry. But he was offered a job by a restaurant two days into a work experience stint and on the following Saturday he started working there part time. He finished Year 10 and started working fulltime while doing his apprenticeship. ”I’ve grown to love hospitality and be passionate about it, so even if you’re not sure, have a go at it,’’ Mr Wills said. At one stage of his career he worked at Sydney University when the Olympic Games were on in 2000. “We catered for all the police and security officers for the Games, serving 1,500 people breakfast lunch and dinner seven days a week,’’ he said. 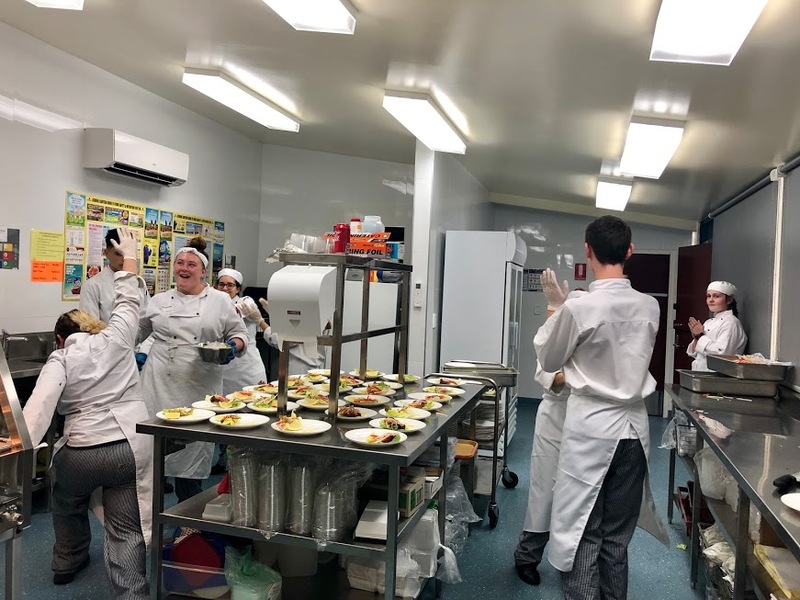 The chefs’ talks were followed with the students cooking up a storm for 100 people, and by all accounts it was a big success. 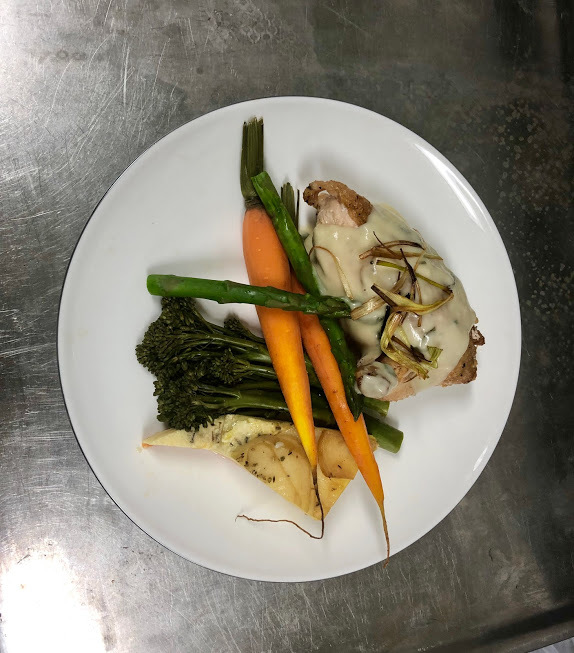 The menu included salt and pepper calamari for entrée, boned and rolled lamb leg medallions with rosemary and honey jus and white chocolate friand with chocolate semifreddo and chocolate shards. Students were guided by the guest chefs alongside mwlp chef and work placement manager Michael Everett. “Tonight was so exciting so much fun. It was an adrenaline rush. Now I’ve had a chance to see what it’s really like,” said Dharma Gregory, who is in Year 11. “I can’t wait to do my work placement,” she said.